January has come and gone as quick as a flash, which I know, many relish as it’s the worst month of the year. I however, always find it flies by as we have hubby’s birthday in the middle. We always used to have a weekend break but with H’s refusal to sleep at the start of January, when it came round to it, we’d only gone and managed to get her to bed at a reasonable time. So a night away was abandoned, for fear of disrupting her again. Then came our colds, and well now it’s February! We also made the big girl bed transition last week… and H absolutely LOVES it! I think being pregnant and having days which revolve around a toddler means the months are very scarily disappearing very fast. So how did January go? We had a few great review posts from the SmarTrike scooter to Digital Monopoly, as well as catching up on our holiday to North Devon last September. I also made a few more pictures for our walls, and am still contemplating selling them if the market is there. Matchstick monkey review by Run Jump Scrap – I love the sound of this teather, H started using her Sophie the Giraffe before she was 3 months old and it always seemed massive, and the wrong size for her teeth tiny mouth. 101 things to do with s child free morning by mum muddling through… Oh the possibilities are endless! 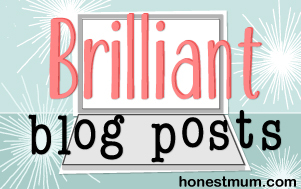 I also have to mention Danielle from Someone’s Mum, who celebrated her blogs first blogiversary. Danielle has done amazingly and really is raising awareness of autism. I have an ace competition coming up – watch out for it!! Family – my sister will be back from her travels this month, something I’m very excited about. I can’t wait to see her, and I’m sure she’ll teach H lots of cheeky things in true Aunty style. Try to keep my blog enthusiasm going, it’s paid off this month with more views, visitors and a jump in rankings (189 in Tots100 & 56 in Blogger Club UK) – thank you everyone for reading. I also love February as daffodils start appearing and creme eggs can be bought – against all my pregnancy chocolate cravings I managed to restrain myself until the 1st of February to buy both. Oh those eggs were delicious! Hi love! Thanks for the mention 🙂 How is the potty training going?! We are thinking, sorry make that WE ARE going to tackle the dummy next week during half term…so we’ll be living our own hell too! Then, it’ll be the big PT next! Ooooh good luck with the dummy! It’s all a bit crazy… She really wants it as she screams ‘no lion pants’ (nappy), and she’s getting it more than accidents. I was attracted by the creme eggs in your photos haha!! Sounds like you had a great January. Here’s to an even better February. Helena on Toddler puzzles: Orchard Toys Once Upon A Time puzzle?